UPDATE: Jaime and her daughter completed this challenge! See their success story and photos here! 1) Consider putting cubbies on the wall above her desk to hold supplies or current projects. My husband and brother-in-law made Lily’s, but Pottery Barn has some as well. 2) If you don’t really need more storage, consider hanging a curtain rod or two on the wall above her desk instead, then hanging artwork from clothespins. My friend Teresa does this in her house and it’s adorable! First, you’ll want to get rid of anything that’s worn out or she no longer uses. Things like old, incomplete projects can probably be tossed. Then, relocate all items that aren’t art supplies. Next, you can group like items together. For example, keep all markers together, all crayons in another spot, and all scissors in yet another section. We use bags and baskets to keep our art supplies organized (I have more information about that in my Frugal Storage Solutions post). After you have like-items grouped, you can see which supplies will fit in which drawer. Maybe you need one drawer of just markers, or maybe you can put markers, craft sticks, glue, and glitter in the same drawer. As long as each like-item is in its own bag or basket, it’ll be easy for your daughter to get her supplies out and put them away again. BONUS TIP: Have your daughter do this project with you if possible because she may have great ideas that neither of us have thought of! Also consider having one drawer for odds and ends. For example, Lily loves having one drawer free to put random craft supplies in – pine cones, toilet paper rolls, old cleaned-out medicine bottles, egg cartons… this gives her a place to keep project idea supplies without overtaking the rest of the room, and having the extra items in one drawer sets a natural limit. When she adds something new to the full drawer, something old needs to go! 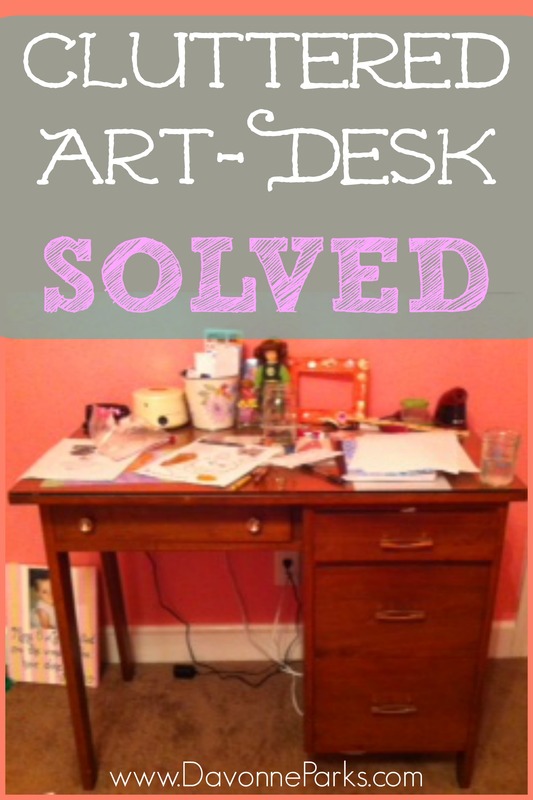 After your initial organization project, help your daughter go through her art desk on occasion. Even though Lily is very organized and loves her art spot, she doesn’t always think of getting rid of her old stuff. So, every few months we go through her desk together and purge items that she no longer wants. 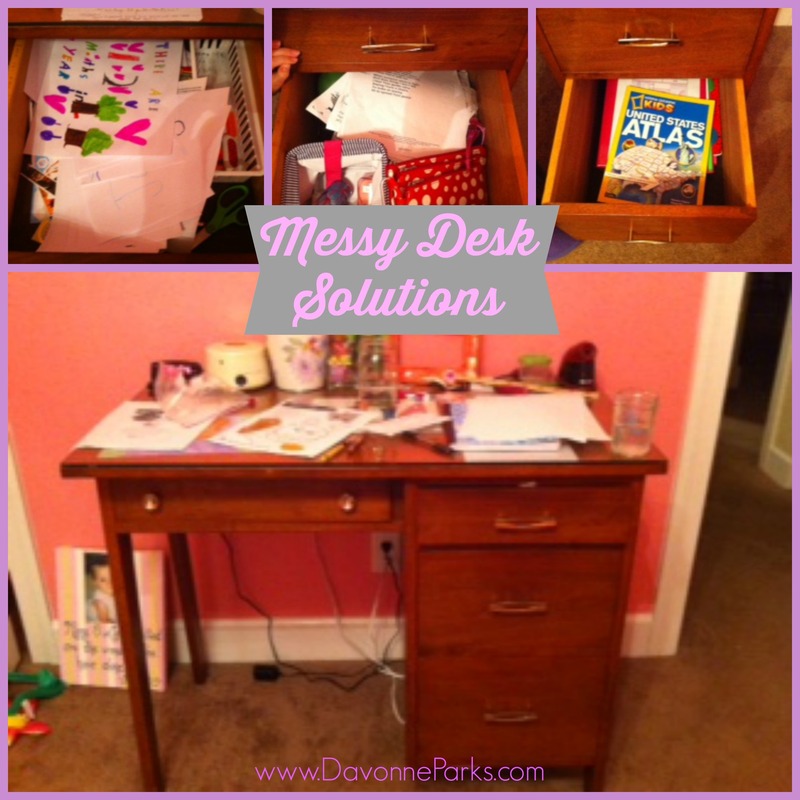 This helps keep the clutter down on a regular basis so her creativity can flow! I hope this helps, Jaime! I can’t wait to share your success story after you finish! PS Readers, don’t forget that if you submit your own mess, you’ll receive a free copy of Chaos to Clutter-Free, plus you’ll be entered into a drawing to win a $50 Amazon Gift Card! Details and submission information are here. A few years ago we had to tame the arts and crafts supplies because they were taking over the house! We gave the grls a bookshelf and said this space was theirs. They needed to make what they wanted to keep fit in this space. I had an extra untensil holder that is on a lazy susan. I won it as a gift from a home party. It ended up being the perfect device to hold the odds and ends that weren’t in large quantities: Rulers, Hold Punch, Stencil Bookmarks, Dry Erase Markers, Glitter Glue Tubes, Paint Brushes, etc. But we needed a solution for the crayons, skinny markers, and regular markers. The dollar store had exactly what we needed. For $1 I bought a set of three stackabe bins. The girls put what would fit in the bins. What was left over was donated to our church. There was just enough room leftover to hold a few plastic latching pencil boxes. One contains paints trays, another sequins, another stamps and stamp pads. These storage tools sit on the top shelf of the bookshelf. The girls have a lot of magazines they were keeping for inspiration. We cut 2 cereal boxes to look like magazine storage bins and I told them they could decorate them with their duct tape collection. What fit in there was kept; extras were donated to the library. These are on the bottom shelf of the bookshelf. 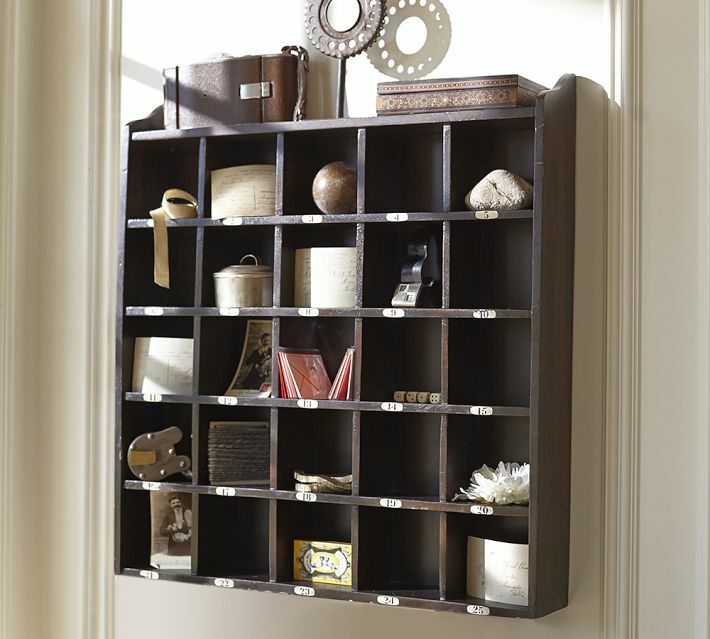 That leaves open space to fit any craft kits they are given on their birthdays or purchase with their own money. The middle shelf has their coloring books, construction paper, drawing/sketch pads, activitiy books, and paint books. The top shelf has the girls in-progress projects (knitting, pom-pom pals, scrapbook). They keep this contained in boxes. WOW!! Great system with super thorough tips. Thank you so much for sharing!